Saint Raphael Preschool is accepting applications for the 2019-2020 school year! Saint Raphael Preschool, partners with parents, community members, the Church, and Saint Raphael School to continue to give our students the Catholic education they each deserve. As the only Catholic Preschool in Marin County, we focus on faith, service and academics. Saint Raphael Preschool, rooted in Dominican tradition, is committed to partnering with parents in spiritual, physical, emotional, psychological academic and intellectual development of young children. The preschool provides a safe environment where children can further their awareness of God's love and creation through informal and formal interaction with adults and other children. The preschool supports the growth of the whole child by offering a variety of opportunity to each child. 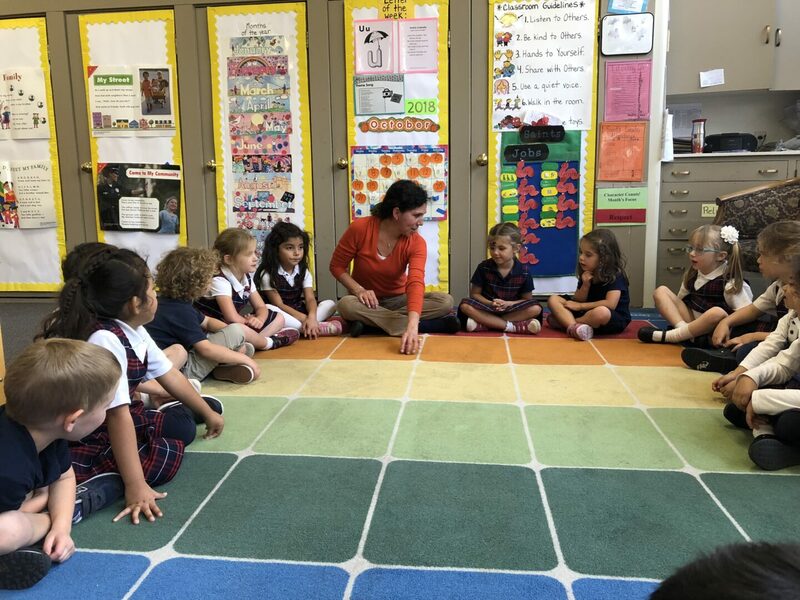 The Catholic preschools of the Archdiocese of San Francisco are committed to the mission of the Church by providing quality, age appropriate learning environments that nurture the development of the whole child. Working with the families, the preschools will focus on preparing the children to be productive citizens. Saint Raphael Preschool, a non-profit community service, is licensed by the State of California, and is owned and operated by the Archdiocese of San Francisco under the leadership of the Pastor of Saint Raphael Parish. Our Preschool is located in downtown San Rafael and is affiliated with Saint Raphael School, which serves children in kindergarten through eighth grade. We provide a safe, stable and stimulating environment of fun, love, friendship and security for children, without regard to race, religion, or ethnic origins. We encourage the individual development of each child and value each child's individual personality. Children discover the joy of learning by exploring and playing safely and freely in age appropriate activities. Mutual trust and respect are developed using certified, nurturing teachers experienced in early childhood education. Children will interact with people, ideas and material and develop a true sense of community. Emphasis is placed on building moral values, self-esteem, problem solving, academic readiness and lifelong skills. Please click the buttons below to check out our Facebook, Instagram, and Yelp page! Music and Movement with Tim Cain! Saint Raphael Preschool is happy to welcome Tim Cain every month to bring the gift of music to the children! Tim has released 5 albums for children between ages of 3-8. Tim's albums have received awards and honors from the Parents' Choice Foundation, the National Assocation of Parenting Publications, and the Grammys. Spanish Lessons with Mrs. Miramontes! As an extra lesson for the children, our very own Linda Miramontes is teaching our children Spanish. Through the use of movement and song our children are learning their body parts, colors, months of the year, numbers, and friendly greetings. Every Friday, the children will be taught the importance of Mindfulness with Patricia Bardoul! Mindfulness offers psychological benefits such as improving memory, self-esteem, concentration, academic performance, and classroom behavior. By clearing the mind and being in the present, there is a relief of stress and tension. The children will learn to manage stress and self-regulate through breathing, awareness, and healthy movement. Saint Raphael Preschool’s Annual Summer Program! Saint Raphael Preschool offers an annual summer program for children ages 3 years-5 years who are potty trained and will be enrolled in the following school year. We offer a fun and dynamic curriculum that will be incorporating S.T.E.M. (Science, Technology, Engineering, and Math). Each week has its’ own fun theme while incorporating S.T.E.M. Please contact our Director, Edith Yates, to schedule a tour of our Preschool and to learn more about our annual summer program.